"While this event was a great success it has to be noted that it was sad to see that the San Jose library ended the event two hours early and unceramoniously kicked people out. The sudden closure prevented many of us including myself from being able to participate. In fact the library staff went so far to call security and cop an attitude with Adisa who put this FREE event together because he went ten minutes over their last minute imposed time limit. One would think that people coming together to play chess would be celebrated especially at a library named after Dr. Martin Luther King, but I guess some people have issues when we get together to do something on an intellectual level. We also gotta remember these libraries are supported by our tax dollars. In any case the next Hip Hop chess tournament in May will be huge and free of haters trying to shut it down." "Historic Hip Hop, Chess & Life Strategies Exhibition and Tournament Creates New Friends and Rivalries in the Game of Kings"
San Jose CA, Feb 26th, 2007- Adisa Banjoko and Leo Libiran, founders of the Hip Hop Chess Federation is proud to announce the world's first Hip-Hop & Chess Exhibition and Tournament was a huge success. Friday, February 23rd 2007 Banjoko hosted the first of many Hip Hop, Chess & Life Strategy Charity Exhibition and Tournament at the MLK Jr. Library, in San Jose, CA. The goal of this free event was to help empower youth through education and entertainment. Rappers, award winning martial arts champions and many others volunteered their time for Bay Area youth. DJ QBert, Starksi, Yogafrog, Award winning director Kevin Epps "Straight Outta Hunters Point", T-K.A.S.H., Bay Area Hip Hop icon DJ Kevvy Kevv, The Natural, Izz Thizz, graff writer Scape One, Casual from Hieroglyphics, Okwerdz, Apakalips from the Universal Zulu Nation, and tons of B-boys, DJ's and MC's descended upon San Jose to bring out the youth. International Master Vinay Bhat, of the East Bay Chess Club, made a special appearance. D'Lamont Robinson of Academic Chess taught new and advanced players the nuances of the 64 squares. He gave participants tips to improve their strategies in life and on the boards. Some of the martial artists dedicating their time included Brazilian Jiu Jitsu Brown Belt Paul Schreiner, Brown Belt Denny Prokopos and Black Belt Alan "Gumby" Marques. "The purpose of the Hip Hop Chess Federation is to use Hip Hop and chess to help young bright minds actualize their potential." "Hip Hop, Chess & Life Strategies event was truly a historic day in Hip Hop history," said Banjoko. "World renowned DJ QBert came through with his time clock in hand. He was dominating folks in speed chess. There is little irony in the fact that the DJ with possibly the fastest hands in turntablism loves speed chess. 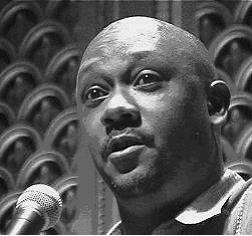 However, without the clock, filmmaker Kevin Epps was able to wear Q down in a fantastic display of intellectual tactics. Izz Thizz, Scape Martinez and Okwerdz had some tough matches as well. DJ Kevvy Kev was nothing less than dominating in his matches through the evening. Many unknown chess snipers came through to wreak havoc on the set. These skilled unsuspecting guests put up a fight that knocked out all the martial artists, including yours truly. Eight-year old "Zen Master" battling at the Hip-Hop tournament. Photo by Shaminder Dulai. One of the most memorable matches of the day was watching an 8-year-old nicknamed 'The Zen Master' defeat Casual from Hieroglyphics! Casual was one of the main supporters of this event and his presence was invaluable. Due to some scheduling issues, a match between Kevvy Kev and Kevin Epps went unfinished! Despite the interruption in the schedule, there is much enthusiasm for the next event. In May of 2007, we will have 'Hip Hop, Chess & Life Strategies II'. Expect to see many more MC's, martial artists and entertainers. We will continue to teach life skills while everyone has fun. " Banjoko plans to host tournaments similar to these in other parts of the nation throughout the year. I think there is a bigger pool of people that are into one or two of them (hip-hop, martial arts and chess) and could therefore be introduced to the other parallel. Think more clearly, you'll make better decisions- the stars will align. Kevin Epps was excited about the night's event stating, "It was an amazing. It is more than chess- it is about community. Just talking to the youngsters made it all worthwhile. This is definitely gonna grow." DJ Kevvy Kev agreed noting, "I think there is a bigger pool of people that are into one or two of them and could therefore be introduced to the other parallel." He noted that the integration of all three has myriad benefits believing through them one will "Think more clearly, you'll make better decisions- the stars will align." "The response from the rap, chess and Hip Hop community was so overwhelming. Prospective sponsors and artist from Chicago, New York and the UK called me requesting we bring the event to their cities and countries. I am happy the demand is growing and it is with great pride that I announce that I have teamed up with State of Minds portal co-founder to create the International Hip Hop Chess Federation. Leo Libiran, co-founder of the first Hip Hop web portal www.stateofminds.com will help spearhead the creation of the Hip Hop Chess Federation. "The purpose of the Hip Hop Chess Federation is to use Hip Hop and chess to help young bright minds actualize their potential" stated Leo Libiran. "The site will be up in a few weeks. 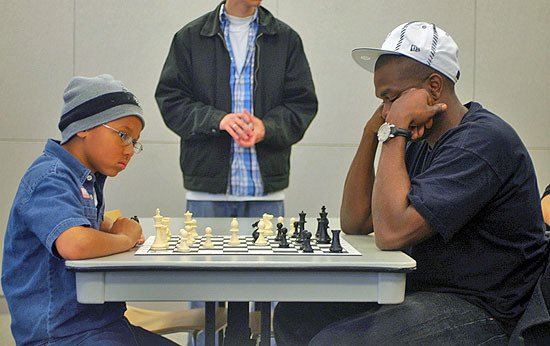 For now, those interested in learning more about the rapid evolution of Hip Hop and chess can visit http://www.myspace.com/hiphopchess We are going to enrich the world one city and one mind at a time," stated Leo Libiran. This event was free of charge and cost because of all the volunteers and sponsors. Sponsors for this event included www.stateofminds.com, www.onthemat.com, www.hiphopcongress.com, www.academicchess.com & www.successchess.com. For more information on the Hip Hop Chess Federation visit: www.myspace.com/hiphopchess. Also see Davey D's "Hip Hop Corner"